A special thanks to my sister and her BF for funding my latest bakeware obsession...tartlet pans. I purchased 24 of these little cuties from Sur La Table yesterday. With over a dozen different sizes and shapes available, I literally perused their tart/pie display rack for a good 45 minutes. At 3 bucks a pop, I wouldn't say that they're cheap, but they're made by the French company Gobel, and are also non-stick, which is a bonus. The recipe below is for one 9-1/2 inch tart, or approximately two dozen 3 inch tartlets. In a stand mixer fitted with a paddle attachment, beat butter and sugar on medium speed until smooth. In a separate bowl, sift together flour and cocoa powder, then add to butter mixture and mix until combined. Add yolks and mix on low speed just until dough comes together. If small pieces remain, knead dough to blend them in. Form dough into a disk and wrap in plastic wrap. Chill for at least 1 hour and up to 3 days. Unwrap dough and set on a lightly floured work surface. 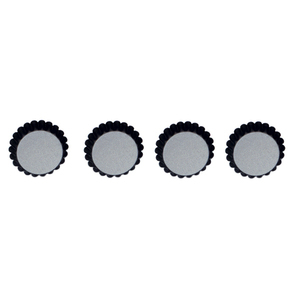 With short strokes from center outward, roll into a 12-in. circle. Transfer dough to a 9 1/2-in tart pan and, using your thumb, press into sides and bottom corner. Trim dough flush with top edge. Line shell with parchment paper, completely fill with dried beans or pie weights, and chill at least 30 minutes. Meanwhile, preheat oven to 350°. Bake dough 10 minutes, then remove parchment and beans and return to oven until dough looks dry, about 5 minutes. Set on a rack to cool slightly. Put chocolate in a medium-size heatproof bowl. In a medium saucepan, combine butter, sugar, and coffee and bring to a boil over medium heat. Pour hot liquid over chocolate and let sit 3 to 4 minutes, then gently stir until smooth. Break eggs into a large bowl and slowly pour in warm chocolate mixture, whisking constantly until incorporated. Pour warm filling into still-warm tart shell. Bake until filling has risen slightly, appears dry on surface, and seems firm when shaken slightly, about 10 minutes. Set on a rack and let cool completely. Put chocolate and corn syrup in a medium bowl. 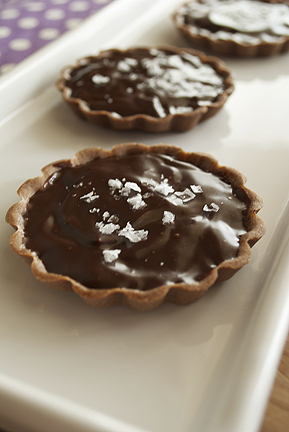 In a microwave-safe container, heat cream to boiling; pour over chocolate. Add butter and stir slowly until smooth, working in one direction to prevent air bubbles from forming (if butter doesn't melt completely, microwave in 5-second intervals to warm slightly). Pour glaze onto center of tart and use a small spatula to push glaze to edges. Let sit at least 15 minutes to set up before slicing. Sprinkle with Maldon sea salt before serving. I'm drooling all over my desk. Holy cow, these look so fabulous. I adore salted chocolate anything - the salty/sweet combination is out of this world. 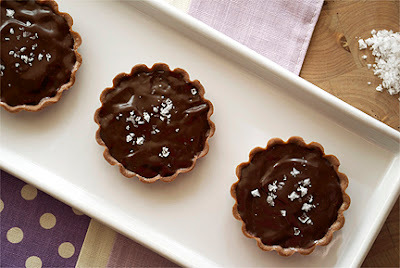 I need to try these tartlets!